The .NET Framework provides a rich set of interfaces, as well as abstract and concrete (non-abstract) classes. You can use the concrete classes as is or, in many cases, derive your own classes from them. The Base Class Library (BCL) is the core of the FCL and provides the most fundamental functionality, which includes classes in namespaces System, System.CodeDom, System.Collections, System.Diagnostics, System.Globalization, System.IO, System.Resources and System.Text. The .NET Framework Class Library is the foundation on which .NET Framework applications, components, and controls are built. Most .NET Framework types are CLS-compliant and can therefore be used from any programming language whose compiler conforms to the CLS. 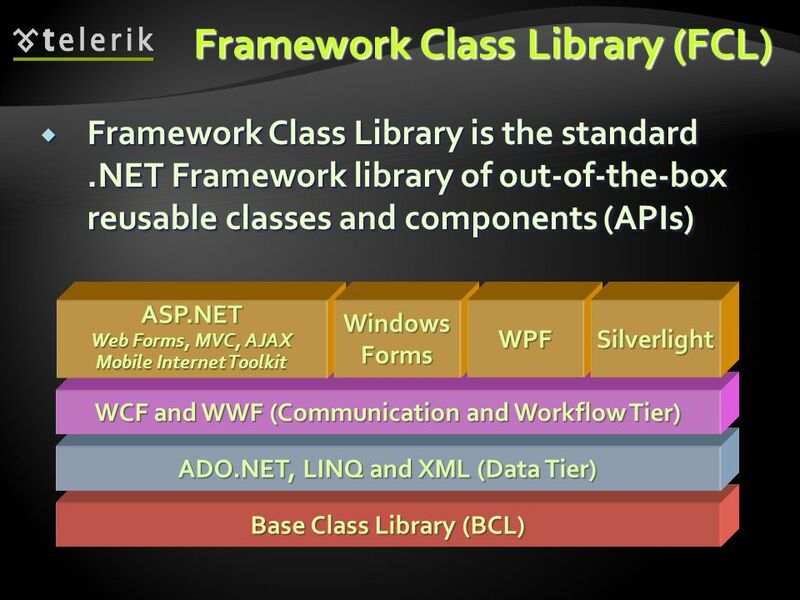 The Base Class Library (BCL) is the core of the FCL and provides the most fundamental functionality.